There’s something about Fridays that has me reached for the comfort food. We laze about after school. We knock about the backyard, and fiddle with Lego. Every few weeks I decide cooking dinner is too much of an effort and get takeaway. And this Friday just gone, I had cream in the fridge that demanded to be used, and that was as good an excuse as any to make scones. The last time I made scones from a recipe book, they weren’t overly nice. A quick text to my mum for her recipe went unanswered, and so I pondered my options, before realising we had a bottle of lemonade in the fridge. Bingo bango, lemonade scones time. A quick google turned up this recipe from Taste.com.au and we were off and racing. Pretend the recipe doesn’t ask for the flour to be sifted, and dump it in a bowl (the flour, not the recipe). Argue with the children that now is not the time to lick the bowl. Why? Because it’s just flour and that’s gross. Argue with the children that no they can’t have a glass of lemonade. Why? Because I’m a mean mama who says water will do just fine. Add the cream and lemonade. Mix to form a soft dough, then turn onto floured surface and knead. Bat away little hands who wish to perform quality control. Hope they aren’t looking when you perform quality control. Cut the scones and brush with milk. Bake for 10-15 until they are that beautiful scone colour. 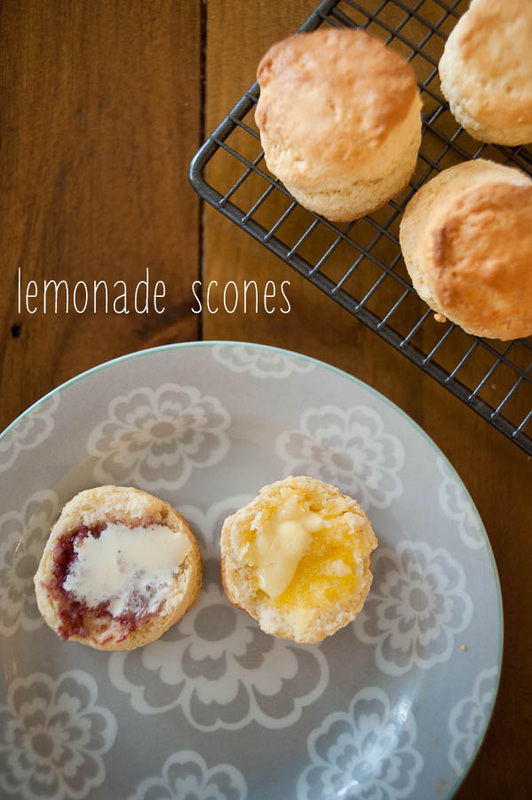 Boil the kettle, make a cuppa and enjoy a scrumptious hot scone. *I used Barambah Organics Pure Cream, because 1) I had it in the fridge and couldn’t be bother going for thick cream, and 2) it is best darn cream I have ever tasted. YUM. ^ I’m thinking fizzy lemonade would likely work better than the week-old flat stuff we had, but they still tasted the part. They really were! I’m keen to make some more, but we are all out of lemonade…which is a good thing for my waistline!